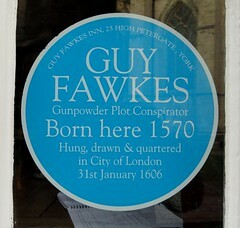 Guy Fawkes (/ˈɡaɪ ˈfɔːks/; 13 April 1570 – 31 January 1606), also known as Guido Fawkes, the name he adopted while fighting for the Spanish, was a member of a group of provincial English Catholics who planned the failed Gunpowder Plot of 1605. 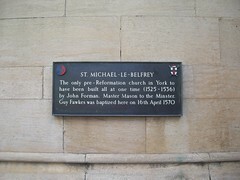 Fawkes was born and educated in York. His father died when Fawkes was eight years old, after which his mother married a recusant Catholic. Fawkes converted to Catholicism and left for the continent, where he fought in the Eighty Years' War on the side of Catholic Spain against Protestant Dutch reformers in the Low Countries. He travelled to Spain to seek support for a Catholic rebellion in England without success. He later met Thomas Wintour, with whom he returned to England. Wintour introduced Fawkes to Robert Catesby, who planned to assassinate King James I and restore a Catholic monarch to the throne. The plotters leased an undercroft beneath the House of Lords, and Fawkes was placed in charge of the gunpowder they stockpiled there. Prompted by the receipt of an anonymous letter, the authorities searched Westminster Palace during the early hours of 5 November, and found Fawkes guarding the explosives. Over the next few days, he was questioned and tortured, and eventually he confessed. Immediately before his execution on 31 January, Fawkes fell from the scaffold where he was to be hanged and broke his neck, thus avoiding the agony of the mutilation that followed. Fawkes became synonymous with the Gunpowder Plot, the failure of which has been commemorated in Britain since 5 November 1605. His effigy is traditionally burned on a bonfire, commonly accompanied by a fireworks display. 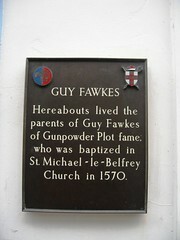 Guy Fawkes Hereabouts lived the parents of Guy Fawkes of Gunpowder Plot fame, who was baptized in St. Michael-le-Belfrey Church in 1570.